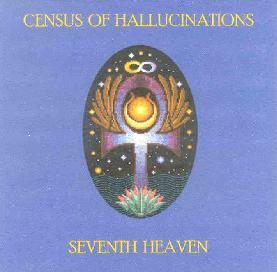 Census Of Hallucinations - "Seventh Heaven"
The great thing about being a Census Of Hallucinations fan is that you don't have to wait very long for the next album to come out. Seventh Heaven is the bands seventh release in 3 years and features more of the trademark CoH brand of music and songs that I consider to be the ultimate marriage of psychedelia and song-oriented progressive rock. The lineup of musicians continues to blur the lines between CoH and it's older sibling The Rabbit's Hat, but long-time fans will by now probably not care, knowing that Tim Jones & Terri~B music by any name is a treat indeed. "Daydream (In The Slipstream)" opens the set and sounds a lot like a Camel song I can't quite place, though CoH give the music their trademark ethereal feel, and Tim & Terri's vocals are, of course, unmistakable, as is Tim's guitar solos which rock hard with a tasty psychedelic flavor. Tim & Terri know how to utilize the wonders of the studio and "The Oats & Ivy Symphony" incorporates fun sounds and samples, in this case farm animals, while exercising a restraint that keeps the music front and center. "Andy Warhol Dancing With Nuns In A Barrel Of Paint" is a 9 minute melodic, fun, and haunting collage-like excursion that is an excellent example of CoH's ability to blend progressive rock and psychedelia. "Mazed And Mystified" is similar but far more trippy, with cool space electronics and Tangerine Dreamy keyboard patterns. "Orgasmic Hairnet Sandwich" travels down the same path and includes elements of Jean Pascal Boffo and Anthony Phillips. And speaking of skillful blending of styles, "The Sun Is Rising" does the same magic mixture with psychedelia and soul. Just gorgeous. "Hard World" and "To Prodigal's Guide" are both excellent songs, the latter featuring the best Tim & Terri vocals on the album. And finally, "Little Sir Echo On Warlock Hill" is a short dreamy track which brings the album to a close. In summary, Census Of Hallucinations continue to crank out strong albums that occupy their own unique place in the prog-psych music and song realm. Start somewhere... just pick one of their albums... and check them out.